The design of the book works for either grammar-based or reading-based approaches, or some mixture of the two. The different sections in the book can be used in whatever order the teacher finds most effective. Grammar exercises present and review key elements of grammar for each reading selection, and Latin synonyms promote reading comprehension. The use of this reading supplement near the end of students' most basic Latin study will help the students develop the ability to handle Latin literature as they reach an advanced level. Bryn Mawr Classical Review 2006.08.34 Rose Williams, Vergil for Beginners: A Dual Approach to Early Vergil Study. Wauconda, IL: Bolchazy-Carducci, 2006. Pp. x, 86. ISBN 0-86516-628-5. $19.00. Reviewed by Pamela Marin, University College, Dublin (marin_pamela@hotmail.com) Word count: 654 words Table of Contents This is a cute little book, aimed primarily at first- and second-year high-school Latin students. It is intended as a reading supplement, and the author's goal is to help students be able to handle Latin literature as they reach a more advanced level. The two approaches within the book deal with both reading and grammar courses, with suggestions as to how to use the various sections of this book. The book is divided into five main sections: a summary of the Aeneid, a short play, tips on reading Latin poetry, six selections from Books I-VI and finally, grammar exercises based on the passages. The first section gives a summary of the Aeneid in a comprehensive, but basic fashion. The language used and the ideas presented are more suitable to a younger audience, but a good teacher, particularly on the university level, will be able to supplement this basic information. The second section, a 'playlet' dealing with various chapters from the Aeneid, again would be more appropriate for a high school/GCSE level, but it is an amusing little play with ideas on how to get students interested in the topic before proceeding to the main part of the book, which deals with reading and translating selected parts of the poem. Section III offers advice on reading Latin poetry and again, further supplemental hand-outs by the teacher would be advisable. The meat of this book is, however, Section IV, which offers passages for comprehension and is a good, solid introduction to Virgil's poetry, style and vocabulary. Williams gives a short preface to each passage, which should allow the student to put each section into context before reading through the various extracts. There is is some English translation, but also Latin-to-Latin vocabulary, which allows students to use and build on the vocabulary they already have. The author gives an introductory sentence or two before the extract, which is also helpful. Each extract is followed by comprehension questions and further discussion/exploration questions, which allow both teacher and student an opportunity to discuss the text, the vocabulary and issues that arise. Unfortunately, there are only six passages selected with an average of 5-10 lines for each extract and a few more sections, particularly if aimed at the college/first year university student, would have been extremely welcome. Section V, entitled 'Carpe Grammaticam', goes through the grammar of each extract in section IV. There are a number of exercises and examples, with additional vocabulary, but this section seems out of place and the reader would have expected this section to be incorporated into Section IV so that both the teacher and student could work on each extract with all grammar and vocabulary in one section, rather than having to go back and forth between the two sections. This book ends with an appendix of abbreviations and a full glossary/ dictionary to assist students in their reading of Virgil. 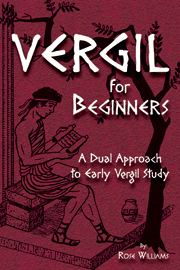 This book does what it says on the cover--it is an approach to elementary Virgil studies, but the dual aspect is not user-friendly. There are some great ideas, including the the Latin-to-Latin and extensive English glossary as well as a good, although basic introduction to Latin poetry, Virgil and the Aeneid. This is a helpful little book, but as a text for self-study, there are some problems. College/university students will not be impressed by the basic, simplistic introductions, but Sections IV/V of the book can be used in isolation and would be an excellent aid in the second semester of first-year Latin. Overall, however, this book is more suited to a high school (11-14 year old) audience and on that level, this book is a helpful and friendly introduction for younger students to gain appreciation of Latin poetry, the style of Virgil and some of Rome's most enduring myths. This book and its exercises will give confidence to students proceeding to the next level and in that, it succeeds.